Fantasy landscape painted in white opaque watercolour on black paper. The composition and perspective are a little wonky because I started painting directly on the blank page (or rather black void), inventing the scene as I went along. This entry was posted in illustration, painting, sketches, watercolour and tagged fantasy, gouache, guitarist, landscape, opaque, titanium white, white on black. Bookmark the permalink. The execution of the flagstones on the rooftop terrace, as well as the mountains and moon, are wonderful (as is all the rest, of course, but these elements I find particularly evocative). Thanks! I definitely want to keep experimenting in this vein. I had never come accross white opaque watercolour before. The little bridge leading to the deep dark water is really intriguing. You can almost feel the cobbled stones at the top of the tower. 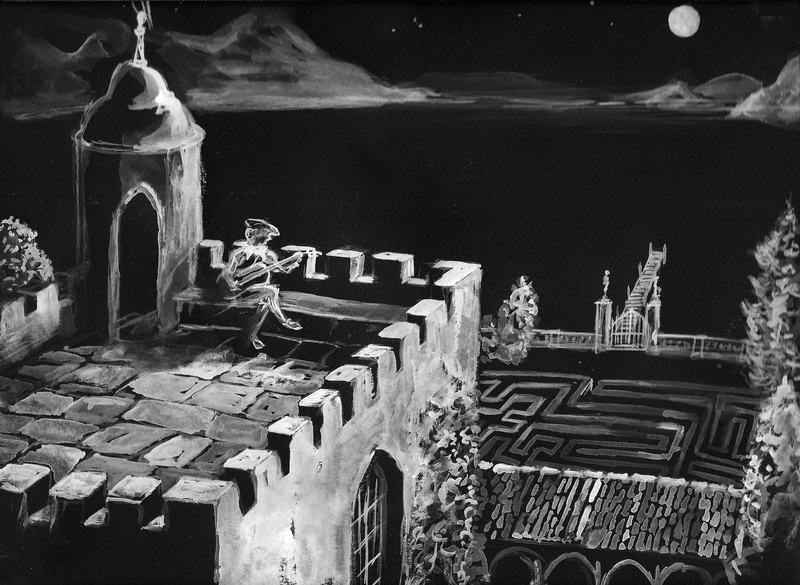 The musician’s silhouette is evanescent: one may wonder if he’s real or a spirit who found his way out of the maze. The vegetation seems partly drawn by the moonlight. Really interesting to look at! It’s definitely a good medium for achieving ghostly effects.